A while back, I decided to turn my daughter's old bedroom into a sewing room. But somehow, I never was very comfortable sewing in there and preferred the old sewing room in the basement. 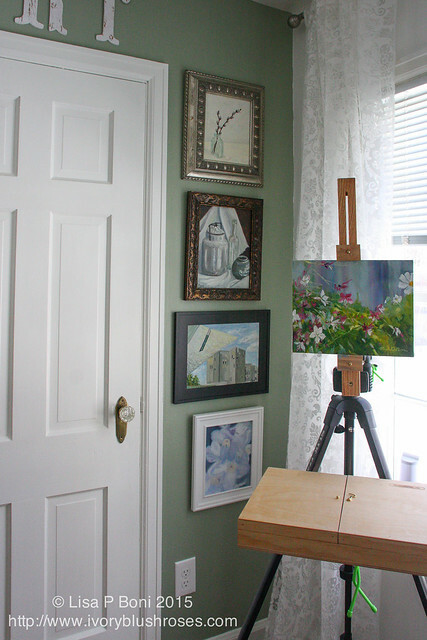 The room become a collect-all room and though it began to accumulate my painting stuff, I still painted out in the kitchen or in my stitching studio (the breakfast nook/butler pantry). 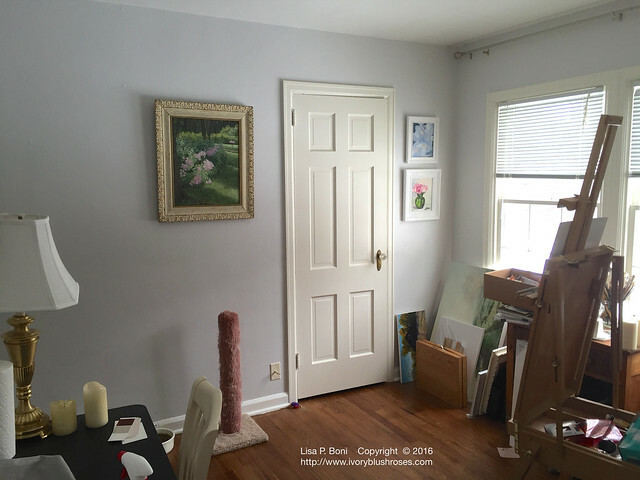 My daughter loved the color of silvery gray, so that's what the room was painted. It should be a good neutral for painting, but I found the color terribly depressing. Enough that it kept me out of the room. It felt so dreary to me. It just wasn't a very inspiring space. Rather depressing. I just couldn't spend enough time in the room to put for any effort. 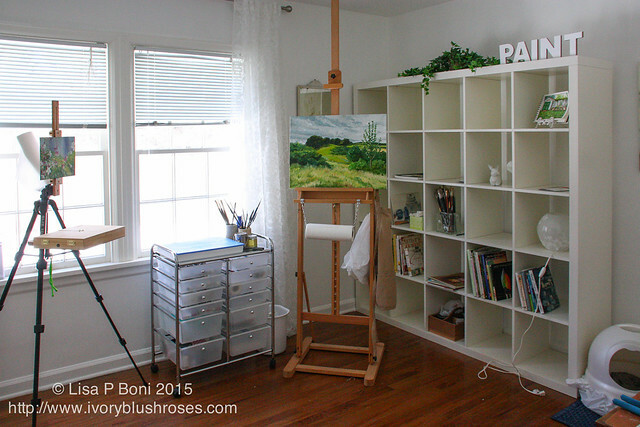 But then I realized that I really needed a dedicated painting space. One that I couldn't wait to get into each day. And so I began thinking about what I wanted to do with the space to make it work for me. Step number one was to make the space my own. It needed paint! 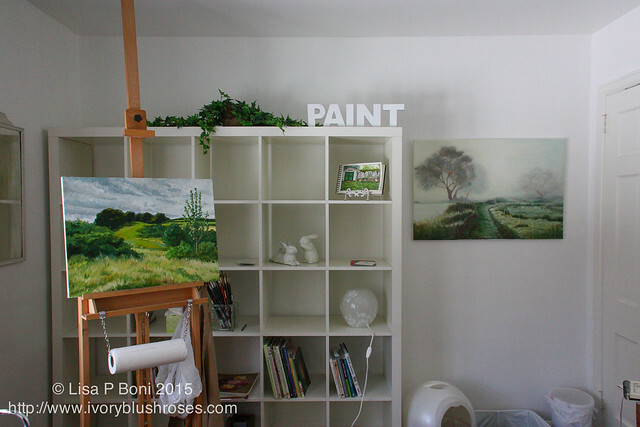 I painted one wall green and the others in my favorite white. I cleared out all the non-painting stuff, rearranged, and downsized some unnecessary things. I also hung up as many of my framed pieces of artwork as I could, that weren't already hanging in other rooms. Yesterday, at last, the space finally came together with the help of my youngest son Zach who helped me move some furniture around! 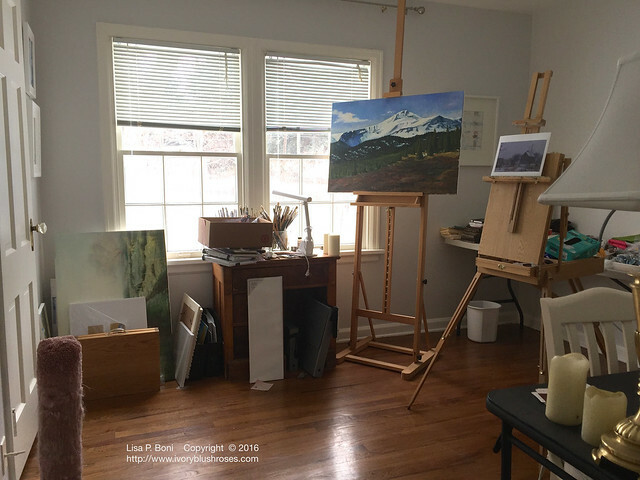 Welcome to my new studio space! I love how light the space is with the new paint. It feels so open! There is room now for my art books and some inspirational bits. 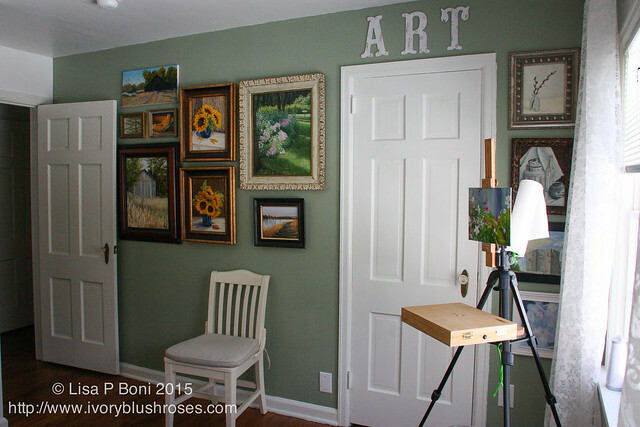 There is a gallery wall filled with my artwork! 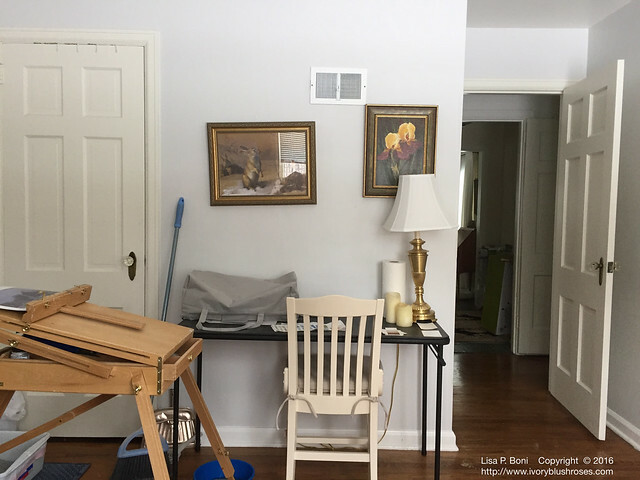 Instead of hiding in the stairwell or in the basement or tucked away in closets, my art is now out where I can see and enjoy it! I anticipate that the display will change periodically as new paintings are created and framed! I love being able to see the variety of things that I have painted over the past decade! 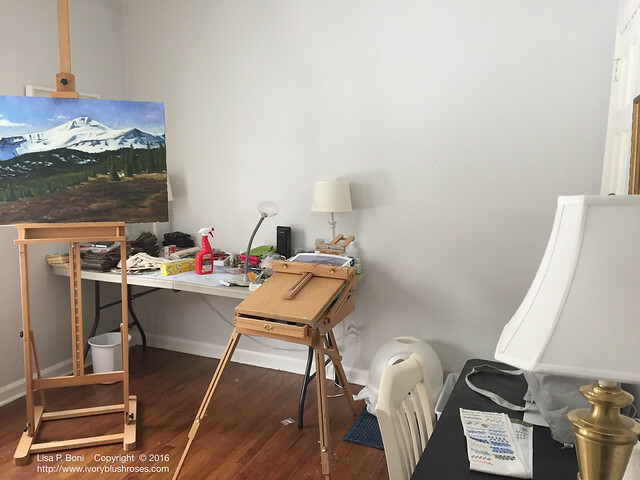 I'm hoping that this new space helps to keep me motivated to paint! There have been a couple of other small home projects as well. I've spent some time updating the main entryway and also my bedroom. Mostly small changes, but all things that make my little house feel even more like home! Such a pretty room! I, for one, am totally envious (not that I'm a painter, but I'd still love to have a space like that). What a difference paint makes!! I love your artwork being displayed. Very inspiring, very lovely. I'd want to have my morning coffee in that room. It's a real delight. Do you sell your artwork? Do you have an Esty shop? It looks just beautiful. Your paintings are amazing. how wonderful! The room is lovely and looks like it has wonderful light for painting. Your work is so beautiful. It is now a very inviting space. 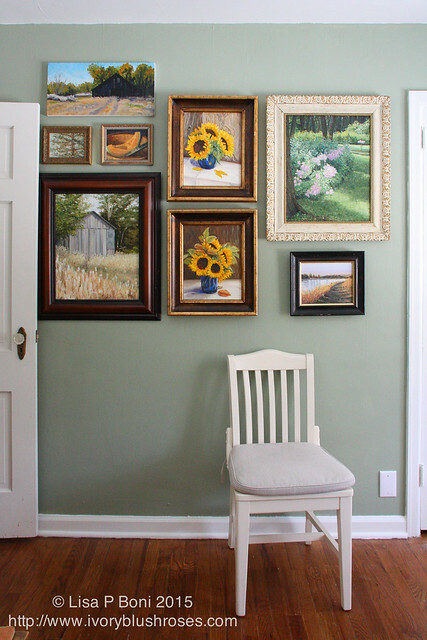 Love the gallery wall, I have a thing for barn paintings. 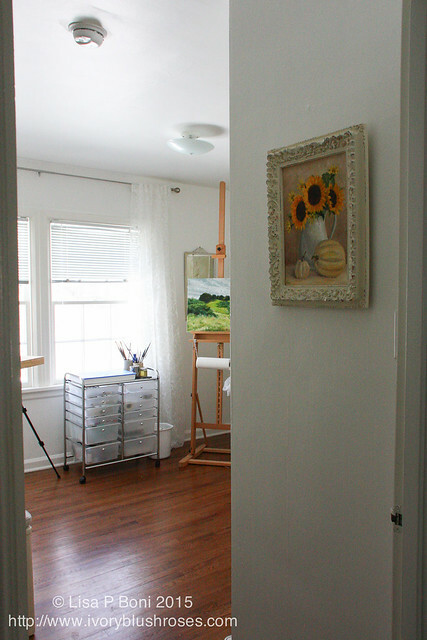 Lisa, you've transformed your room into a warm, sunny and serene space that I'm sure you'll find inspiring. It's beautiful! What a wonderful space. Lots of masterpieces are on the way.